For those uninitiated, sit comfortably and pour yourself a cup of coffee (or scotch, timezone dependent). The 6263 Big-Eye is one of my all time favorite references and here, over my morning coffee, I’ll explain why. I have been accused of being too partial to the great coronet, but there is a reason that ‘Rolex’ and ‘The King’ are nearly interchangeable. Because I am such a childish fan of the Rolex Daytona Big-Eye, I’ll dive a little deeper than usual in this feature—out of sheer appreciation. If you just want to see the piece, you can find it here from RPM for some ungodly figure that is irrelevant. It will continue appreciating to double that in a decade. An now, the history. You know the Daytona beach Road Course, I am sure. The Circuit de la Sarthe of the United States. How did a Swiss manufacturer pick up an American name? Well, it all begins in 1955 where they had just introduced the 6234 pictured below (credit Roy from VRF). This was a post-war Rolex that somehow defeated all odds to build a beast of an instrument off of an overhauled Valjoux movement. The antimagnetic chronograph featured deadly accuracy and tachy/tele rings on the outer dial. The evolution to what we now think of as the classic Daytona really begins here. Following was an intermediary step, the 6238, where the 6234 acquired more clearly legible hands and markers, a more legible tach scale, and kept the iconic Valjoux 72. For those of you who are partial these days to in-house movements (I have mixed emotions at best), here’s some evidence that collectibility is not necessarily correlated. For most collectors, historical significance and scarcity are enough. Now we arrive to the final step. Rolex added the tachymeter to the steel bezel, created contrast dials, and voilá. We have something known as the 6239. That 6239 released in 1963 without ‘Daytona’ emblazoned above the sub hours. However, in the interval between 1963 and 1965, Rolex was the official timekeepers of the Daytona Road Racing course. The degree to which this was corporate elbowing or Rolex instruments simply being favored by the timekeepers of the course as superior to alternatives is disputed. 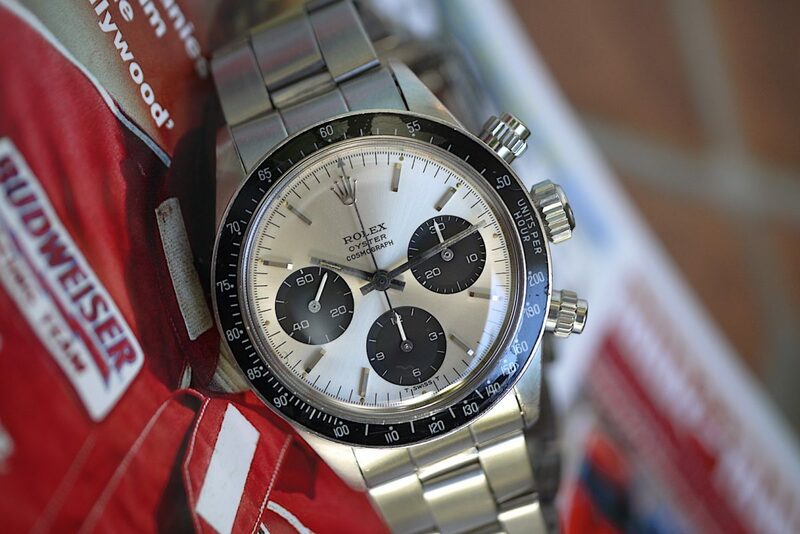 In either case, by 1965 the 6239 had become such a staple of road racing that Rolex decided to flaunt what it had and finally printed the famous DAYTONA, giving birth to an icon (credit also RPM below). What followed was an evolution on success. For all this time, the case remained 37mm (some of us wish it might return there as well, I count myself among that group). With the next reference, the 6240, came screw-down pushers and the equally famous oyster line under Rolex. The latter 6262 & 6264 housed a newly reworked cal 727 Valjoux but did away with the screw-down pushers in a separate model line. Halfway through the two-year relatively unsuccessful lifespan of these two non-oysters, the screw-downs were reintroduced on the 6263 & 6265 (plastic vs metal bezel references). These two references have gone on to be produced with a wide variation in dials, hands, and materials. Variability can make collecting these quite a minefield, but an enthralling one to be sure. The Daytona was also adopted here by one Paul Newman. The two have been inextricably linked since until his passing 2008. His standard dial 6263 was the first of many he would go on to own, but is particularly special as first loves always are. What followed the 6263 was a thee era of Rolex chronographs. In fact, the great man’s own latter 6239 with what Rolex would call exotic, what we would call ‘Paul Newman’ dial is coming up at auction later this year. It will likely set an all-time record for Rolex and rightly so. It suffices to say that the 6263 was Rolex’s blueprint for what would become a history of pure gold. And because of that alone, it holds a special place in many collector’s hearts. That little sampler of history brings us right back to the example that just hit market. A classic white-dialed 6263 with a neat little variation (there were many) known as a big-eye. The black subdials are all just slightly increased in diameter for a very, very slight legibility upgrade. Nonetheless, it is a little something special and that’s all you need for huge interest in classic Rolex. Some say it brings out the bezel. Others claim it looks more masculine by comparison. Who cares, it’s special. This example also comes to us on an original fairly tight band and completely unpolished with a little honest wear. If the indiscriminately clean aesthetic of the white 6263 big-eye non-daytona cosmograph is your thing, this is as good as it gets. RPM are a great dealer, so dear readers please treat them well. Again, you may find this 6263 Big-Eye here.